Welcome to Board Watch for WCCUSD’s March 2nd Meeting! At this week’s meeting, the West Contra Costa Unified School District Board of Education heard an update on the district’s progress to Local Control Accountability Plan (LCAP) Goals 2 and 3 around improving instructional practice and increasing parent/community engagement, and heard an overview of the district’s charter schools. The Local Control Accountability Plan (LCAP) is a planning tool for districts to show how they will improve student outcomes and performance, with attention to English Learners, low-income students, and foster youth. 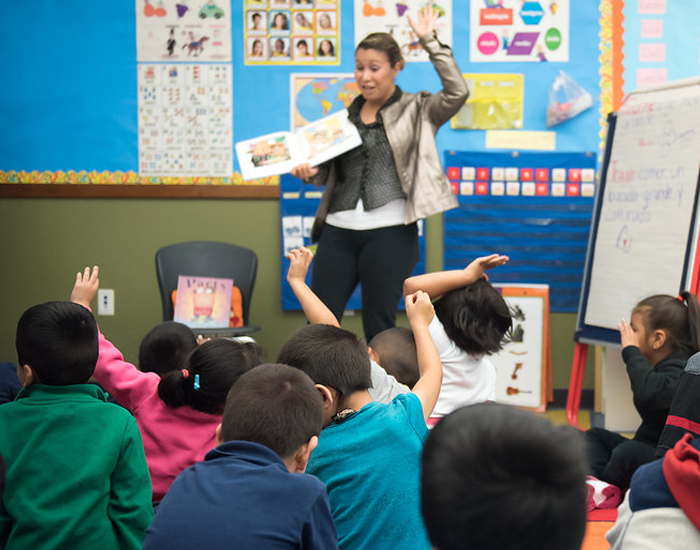 WCCUSD’s LCAP includes five goals, 30 actions and services, and 38 measures. Click here to view WCCUSD’s Local Control Accountability Plan. WCCUSD administered the LCAP Student Survey in June of 2015 to approximately 4,900 fourth, sixth, and eighth graders. One of the district’s specific LCAP Goal 2 measures is to increase the rate of ‘Often’ responses by 3% next year. The results for this school year have not yet been collected, and will be done so in June 2016. Why It Will Matter: Survey data in 2016 showing that students report an increase in “Often” having CCSS-aligned learning experiences indicates an improvement in instructional practice from the 2014-15 school year. Another one of the district’s specific LCAP Goal 2 measures is to increase the share, by 3%, of new teachers who stay into their fourth year with the district. 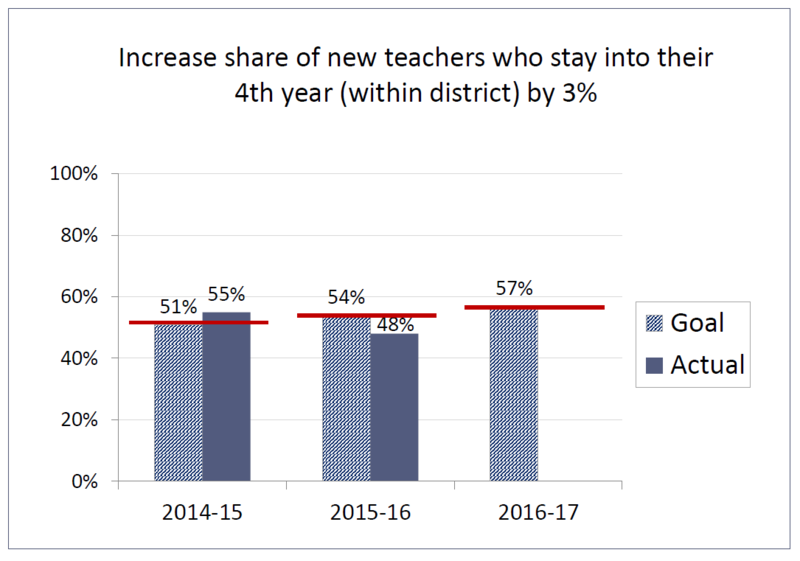 As shown by the chart below, the share of new teachers who stayed into their fourth year for the 2015-16 school year decreased by 15% from 55% to 48% of new teachers. The district’s goal is to improve the 4-year new teacher retention rate to 57% for the upcoming school year. The final measure shared was the district’s LCAP Goal 2 measure of increasing the proportion, by 5%, of principals who stay into their fourth year at the same school site. 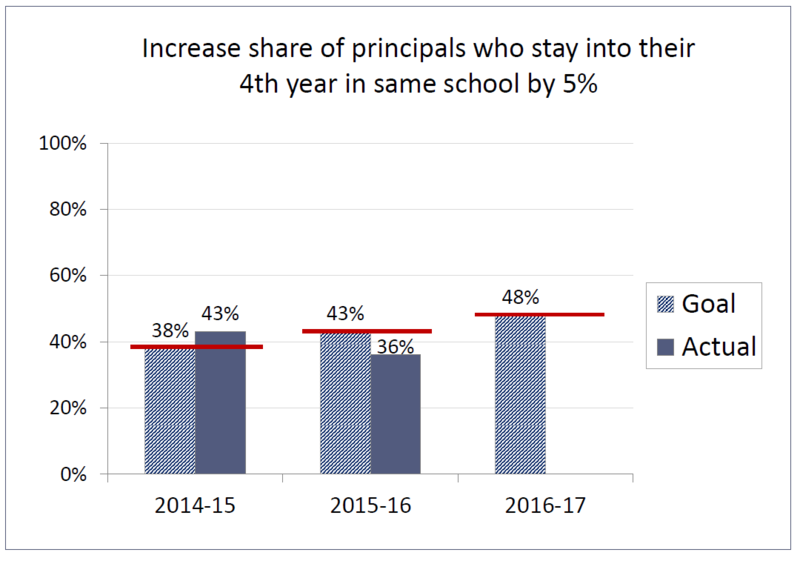 As shown by the chart below, the share for the 2015-16 school year decreased by 16% from 43% in 2014-15 to 36% of principals presently staying into their fourth year at the same school site. The district’s goal for next year is to increase the 4-year principal school site retention rate to 48% in 2016-17. Last year, the district met its goal of increasing the response rate by 10%. WCCUSD is currently working with its school community outreach workers to drive survey responses among parents for the 2015-16 school year. Last school year, 290 parents graduated from Parent University. The district’s goal this year is to increase that number to 500, and 650 in 2016-17. The district is currently in the process of collecting parent responses to this survey, and aims to collect more than 3,000 responses over the next month. Click here to view the full LCAP Goals 2 & 3 presentation, including information on the actions and services WCCUSD has implemented this school year around these goals. Dr. Linda Delgado, Charter School Coordinator, presented the board with an overview of the district’s 12 charter schools. Five are grouped in the Hilltop. Six are located in central Richmond. One is located in El Cerrito. Charter school students comprise 13% of district students (3,904 in total). 80% of the charter schools are run by a Charter Management Organization (CMO). Some are district-funded while others are county-funded. A team conducts formal annual visits of each charter school, including a review of requested documents, classroom observations, and interviews with focus groups of students, parents, teachers, board members, and the school director of each charter school. Sharing and exchanging of best practices between district and charter staff or teams. Provision of facilities (five charters currently occupy district facilities). Collaborative, students-focused problem-solving to meet the needs of parents and families. Click here to view the full Charter Schools Overview Presentation.